Best of 2010 lists can be found everywhere this week, so I decided to do my own. 2010 was a good year for me. It was the first full calendar year of my daughter’s life. The change in her from the beginning of the year to the end is monumental. She has grown from a baby into a girl in just 12 short months. Back in April -- one of the first times I found her on her stomach in her crib. 1. Lexiana got more mobile. She started the year not able to sit up on her own or roll over. She is now walking. The first time she sat up on her own, I was astonished. I put her into the sitting position and moved back slightly. I couldn’t believe she stayed up. And then she started with rolling. I’d put her on her belly and get so excited when she flipped over to her back. I even kept count for a while. For about two weeks, I could tell you exactly how many times she had rolled over. Then she really got going. I remember the first time I found her in her crib on her stomach instead of her back like I had left her. I also remember the first time she rolled away from where I had left her. I was in the bathroom getting ready. I had her set up on a blanket with toys in front of the open bathroom door. I looked over and she was gone. She rolled herself a couple of feet away. On Christmas morning walking around with one of my presents. up to standing and cruising around furniture, we did more baby-proofing. Then she started walking on her knees. Finally, she has started walking on her feet. She has come a long way in a year, my daughter. 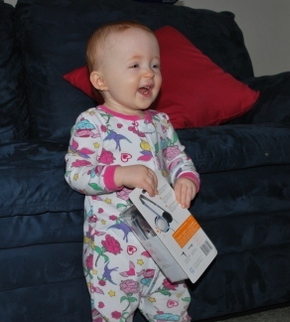 And I couldn’t be more proud as I see her toddle around our house. I have cheered her on each step of the way and been as proud for each stage of mobility as if she had won the Nobel Prize. These are the joys of a mother’s life. 2. Lexiana started laughing. Her first laugh was the sweetest sound. It was a bit like her smile. We had worked hard for so long to take care of her and had little feedback. Finally, she was able to give back to us. It’s amazing how one little laugh spoke so loudly to my heart. At first, my husband could get her to laugh the most. I would stand back with tears in my eyes at the sweetness of the two of them playing together for the first times. She still thinks he’s the funniest man on the planet — and I agree. Now she can do a full belly laugh. She laughs easily and often. It is still the sweetest sound. It fills my heart with love and peace. Now her vocabulary expands pretty much everyday. My girl is a talker. She’s learning to use her words instead of fussing. She says “Up” when she wants us to pick her up. She says “Help” when she drops a toy and can’t get to it. She says “Book” when she wants me to read to her. She says “Bite” when she wants more food. She says, “Hi, Buckles” to our dog. She says “Jesus” when she looks at a painting of Him on our living room wall. She says all kinds of things. We seldom talk for her any more. Lexiana has found her voice and words to go with it. She is a smart, talkative girl. 4. I stopped pumping. Due to issues beyond my control, I exclusively pumped breast milk and then bottle fed my daughter from the end of her first week on. My goal was to give her breast milk for six months. I was able to do so for just over a year. I’m amazed by that. It was hard work. I’ll never forget when I realized I had enough frozen milk to stop by the beginning of August. I remember distinctly my last pumping session. It was in a hotel room, actually. It was the morning after my first night away from Lexiana. Over our anniversary weekend we headed to Gen Con Indy. I woke up and pumped for five minutes while my husband was still asleep. That was it. No longer being tied to the pump has given me more freedom. While I’m thankful to have been able to provide her with breast milk, I am also thankful that I no longer have to pump. 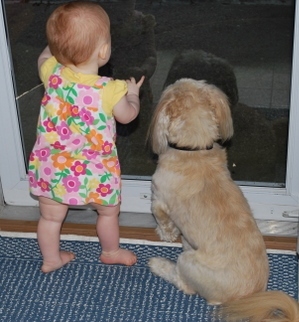 The kids standing guard at our front door back in September. he gave her space. Right about the time he got used to her, she started moving. He was, in fact, her motivation to move. She wanted so badly to get to him that she would start rolling. Then she started crawling for him. Buckles had to adjust again to a mobile baby. He learned quickly to get out of her way. She pulled his ears and his tail, and he just looked at her. But, a few months ago, they started playing together. First Lexiana would pick up his ball and try to chew on it herself (ugh!) or hold it. Then she learned to give it to him. Now they have found their own way of playing together and it’s sweet. She loves him to pieces. 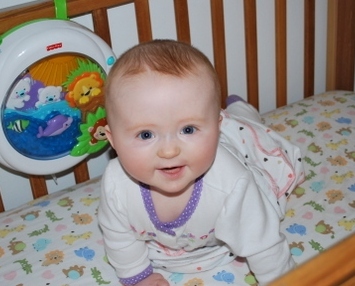 Every time she’s up from her crib, we have to find Buckles to say hello. She thinks he’s hilarious. He likes her. Sometimes I think he pretends like he’s indifferent, but he counts her in his pack now. When we are all in the car together, he stays right beside her instead of on the other side of the backseat. When she is crying, he comes to see why. They’ve forged their own relationship and I love watching them together. In the lake for the first time on our first vacation back in June. business trips and singing appointments together. But, this year we had our first family vacations with more than just Buckles. It was great fun and great stress. My husband had a few grumbles about how much stuff I packed, but we had fun. 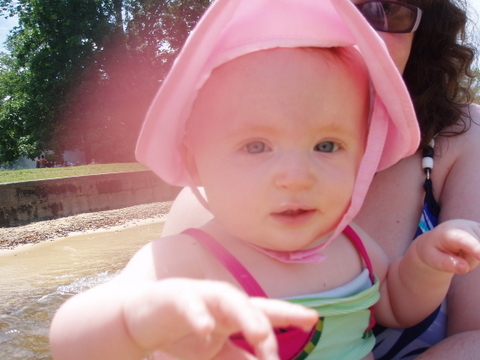 I was thrilled to introduce Lexiana to the vacation spot in Tennessee where my family has always gone. I have gone there as long as I can remember and have great memories. Being able to now share that experience with my own child is wonderful. Vacation also helped me realize that we are really mobile. We learned that we can still relax and enjoy downtime while taking care of a kiddo. 2010. It was a good year indeed.